A combobox control with an easy interface to display multiple columns, with their own color, font, alignment and with text or images. 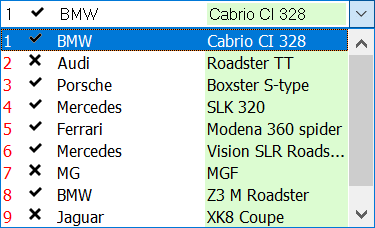 The selected item can be viewed in column style or just one column. The Combobox can have either the normal look or the flat Office 2000 look. Sorted & SortColumn property to allow sorting on any column. LookupIncr & LookupColumn property to allow (incremental) keyboard lookup on any column.